A speech recognition user interface works when it … disappears! Today is a big day for me! I’m finally getting to meet in person one of the Coryphées of the VUI Design World (even though as far as I know he’s not a ballet dancer), Bruce Balentine of the Enterprise Integration Group (EIG). 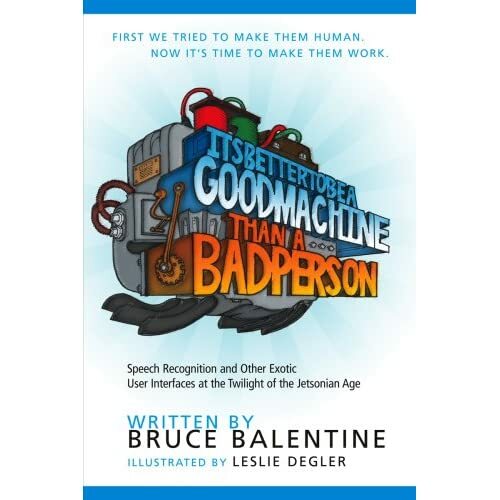 Bruce is the author of one of the best books ever written on IVR / Speech applications / Voice User Interface Design, It’s Better to Be a Good Machine Than a Bad Person – Speech Recognition and Other Exotic User Interfaces at the Twilight of the Jetsonian Age. In closing, I must ask the question. Will it ever work? And, of course, the answer is, yes. Speech recognition—and its related technologies (e.g., speaker verification, text-to-speech, audio indexing, speech data mining, dictation) will work. Indeed they already do. They will fill their respective application niches almost completely. And, in fact, the majority will do so quite soon. What will change is the definition of “work”. After you have received your refund, we’ll call you with an outbound IVR that asks you several hundred thought-provoking questions about your customer experience. We value your opinion—please give us your most honest and spontaneous responses. We’ll do our best to recognize them. To date, I have only met Bruce virtually, through Skype calls and the Creative Speech Technology Network (CreST) of which we are both members, and I can already tell he is a very funny, witty, creative (musical! ), interesting, as well as intelligent person. So I can’t wait to meet him in person later today and hear some more fascinating stories and hilarious anecdotes from the world of speech recognition application design, voice interface usability and technology abuse! I went (to the dinner with Bruce) and (was) conquered by the brilliance and witticism of the man! I got my long-awaited autograph in his book too, as I can now prove! 2010 saw the first SpeechTEK Conference to have taken place outside of the US, SpeechTEK Europe 2010 in London. This year’s European Conference, SpeechTEK Europe 2011, will take place again in London (25 – 26 May 2011), but this time it will be preceded on Tuesday 24th May by a special Workshop on Cross-linguistic & Cross-cultural Voice Interaction Design organised by the Association for Voice Interaction Design (AVIxD). The main goal of AVIxD is to bring together voice interaction and experience designers from both Industry and Academia and, among other things, to “eliminate apathy and antipathy toward the need for good design of automated voice services” (that’s my favourite!). This is the first AVIxD Workshop to take place in Europe and I am honoured to have been appointed Co-Chair alongside Caroline Leathem-Collins from EIG. Participation is free to AVIxD members and just £25 for non-members (which may be applied towards AVIxD membership). However in order to participate in the workshop, you need to submit a brief position paper in English (approx. 500 words) on any of the special topics of interest of the Workshop (See CFP below). The deadline for electronic submissions is Friday 25 March, so you need to hurry if you want to be part of it! The Association for Voice Interaction Design (AVIxD) invites you to join us for our first voice interaction design workshop held in Europe, Cross-linguistic & Cross-cultural Voice Interaction Design. The AVIxD workshop is a hands-on day-long session in which voice user interface practitioners come together to debate a topic of interest to the speech community. The workshop is a unique opportunity for them to meet with their peers and delve deeply into a single topic. As in previous years with the AVIxD Workshops held in the US, we will write papers based on our discussions which we will then publish on www.avixd.org. Please visit our website to see papers from previous workshops, and for more details on the purpose of the organization and how you can be part of it. We always encourage the use of specific examples from applications you’ve worked on in your position paper. Participation is free to AVIxD members; non-members will be charged £25, which may be applied towards AVIxD membership at the workshop. Please submit your position papers via email no later than Friday 25 March 2011 to cfp@avixd.org. Letters of acceptance will be sent out on 30 March 2011. We look forward to engaging with the European speech design community to discuss the particular challenges of designing speech solutions for users from diverse linguistic and cultural backgrounds. Feel free to contact either of the co-chairs below, if you have any questions. SpeechTEK Europe 2011 has come and gone and I’ve got many interesting things to report (as I have been tweeting through my @dialogconnectio Twitter account). But first, here are the slides for my presentation at the main conference on the outcome of the AVIxD Workshop on Cross-linguistic & Cross-cultural Voice Interaction Design organised by the Association for Voice Interaction Design (AVIxD). I only had 12 hours to prepare them – including sleep and London tube commute – so I had to practically keep working on them until shortly before the Session! Still I think the slides capture the breadth and depth of topics discussed or at least touched upon at the Workshop. There are several people now writing up on all these topics and there should be one or more White papers on them very soon (by the end of July we hope!). So the slides did their job after all! Get the slides in PDF here: Maria Aretoulaki – SpeechTEK Europe 2011 presentation .